Would you like to set an hour aside for quiet openness by joining us in Quaker worship? 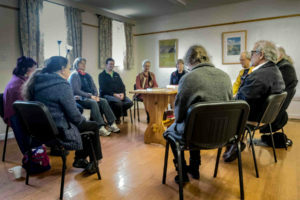 ‘Friends’, as Quakers refer to themselves, and anyone who would like to meet with us, will find us here at Curtis House which is part of The Court House in St David’s, each Sunday at 11am for a ‘Meeting for Worship’. We meet mainly in silent worship; everyone is welcome and there are no ‘special’ seats, just come in & sit down where you like.